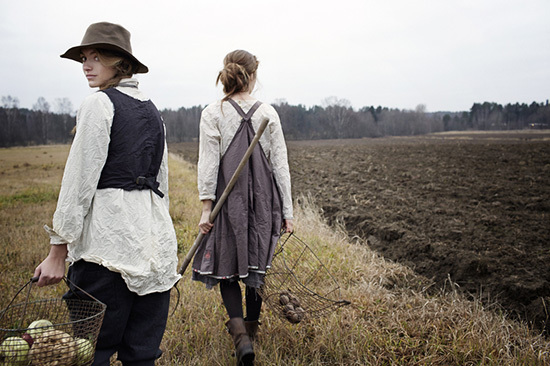 Having been raised by three generations of hardworking women, Willow and Thatch has the apron-pinafore-smock rooted firmly in her psyche and heart. For my great-grandmother, the apron was more utilitarian than anything else – she wore her over-the-head style to protect her housedress while hanging out the washing, making potato dumplings, snapping peas and picking sour cherries for her homemade wine. The generous pocket held hard candies and a hankie, and maybe a spare hairpin. 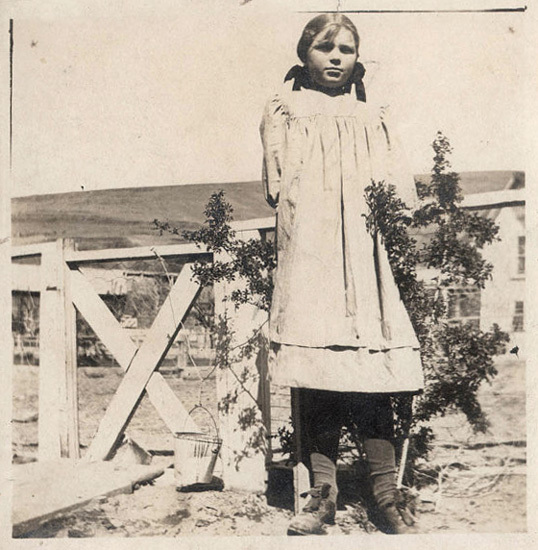 The apron pinafore also brings me a sense of belonging to a long line of girls and women I have never met; the children and women of the frontier, the Edwardian mother canning and putting food by for the winter, the girls in the photos below. 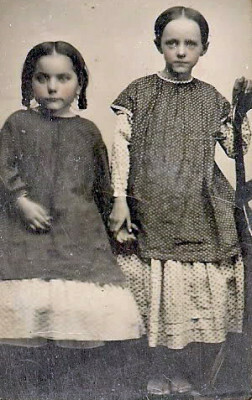 Both girls in this tintype are adorable in their Victorian era pinafore dresses. If you look closely you can see the rick-rack trim detailing the neckline and sleeves of the pinnie on the right. It isn’t difficult to imagine one’s self as the mother who sewed these for her daughters. 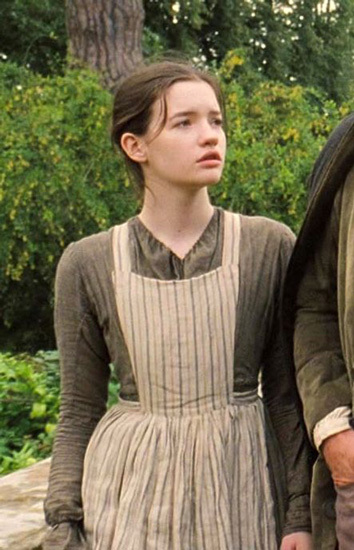 My notion of women being connected through the history of the apron pinafore, is further romanticized by its appearance in period dramas. 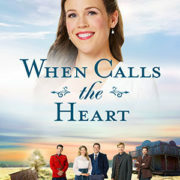 It seems that Molly Gibson is always wearing some kind of apron or apron dress, in Elizabeth Gaskell’s Wives and Daughters (1999), which takes place among pre-Victorian English country society, in the 1820s. Kara Shallenberg runs In Timely Fashion, a site designed for those who find delight in “past-dressing ”- not for special occasions only, but on a daily basis. She recreated Molly’s apron with sewing instructions. Thanks Kara! This is Mary Bennet in her Regency era house apron, in Pride & Prejudice (2005). 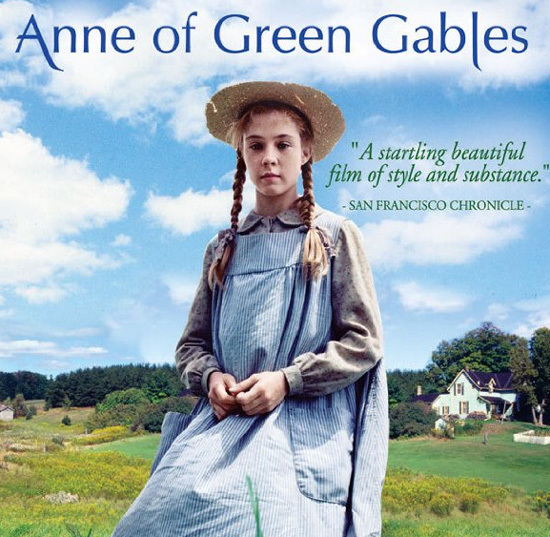 When I think Anne of Green Gables (1985), I always see Anne and Diana in their Edwardian era pinafores. 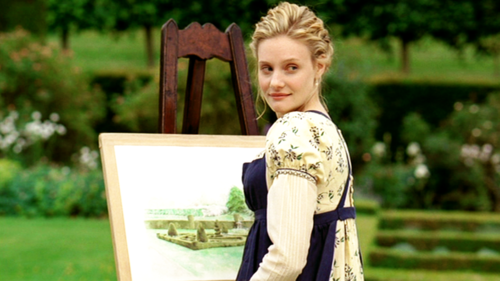 And there is the unforgettable Regency era apron from costume designer Rosalind Ebbutt, that Romola Garai wears as Jane Austen’s Emma (2009), while painting the gardens en plein air. And this buttoned up the back, open at the bottom for-school pinafore shows up in the latest adaptation of Little Women from BBC and PBS Masterpiece. Over at Unsung Sewing Patterns, there are some terrific vintage apron patterns, among the pajamas, nightgowns, uniforms, smocks and costumes. Unsung Sewing Patterns was established to document an ongoing experiment in sewing new clothes from old patterns. The bulk of the patters on the site are from the 1910s – 1940s, but also cover some time before and after these dates. 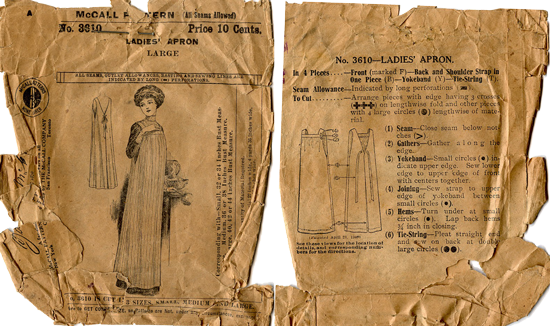 The patterns are not for sale, and tracings are not available, but for those of you here excited to take on a sewing project, Unsung Sewing Patterns says that she is happy to provide high resolution scans, or more complete scans of images that she has cropped. So lovely. She sews so well that it is inspiring. This is the Edwardian era Banner 131 – Ladies’ Sack Apron or Overall, from after 1901, probably before 1910. The sack apron in the no. 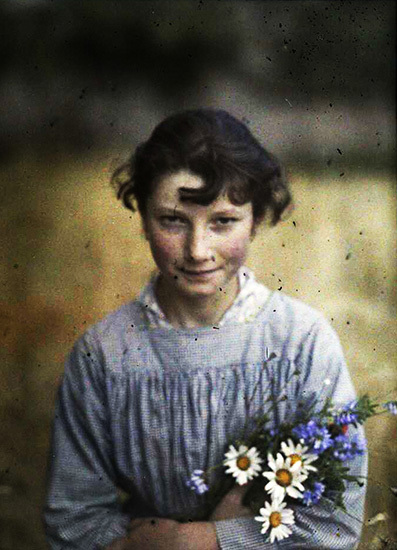 131 pattern has sleeves, and looks similar to me to this one worn by the young girl below, photographed with her wildflowers in 1910 by Gustave Gain (1876-1945). Gain was a research professor in Chemistry at the National Museum of Natural History in Paris, spending summers along the English Channel in Brittany and Normandy, making autochromes of his family and friends. 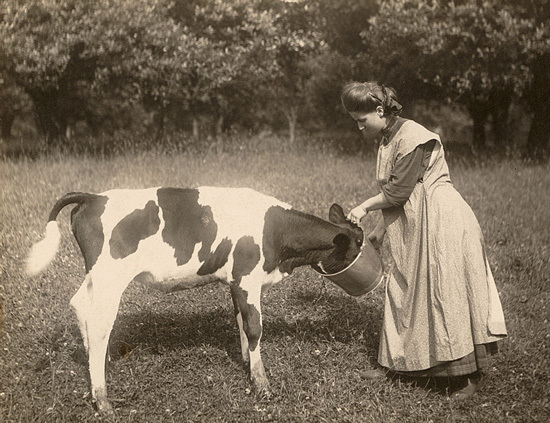 Interested in the latest scientific advancements, Gain used the early color photographic process developed by the Lumière brothers to photograph in Bretagne (Brittany), one of the most historic provinces of France. Willow and Thatch would just love to wear this pinafore everyday! I’ve just purchased a vintage pattern for a pinafore that is similar, but sleeveless. I like the idea of a yoke with wide straps and a straight band, with gathers all the way across the front, and an open back. Something that falls below the knee, to wear over skirts and pants. We will see…it may take me months to pick out a fabric, though the blue gingham is classic. 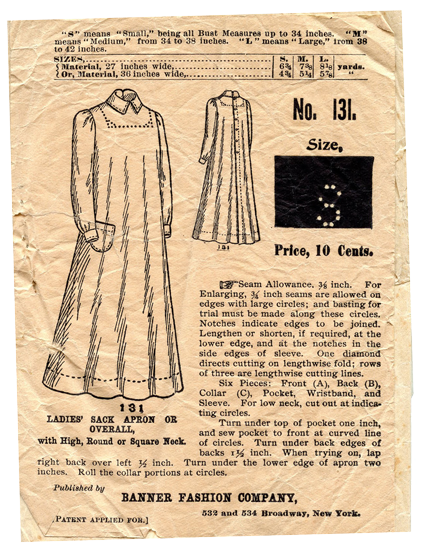 Here we have a pattern for the Edwardian era McCall 3610 – Ladies’ Apron, with a deep v-back and no pockets. Also very nice. Don’t they all look fine in their aprons and pinafores? The woman on the left appears to have belted her pinafore dress. Such great hair, too. The little one certainly appears to be in a mood, despite her charming pinafore. Pattern no. 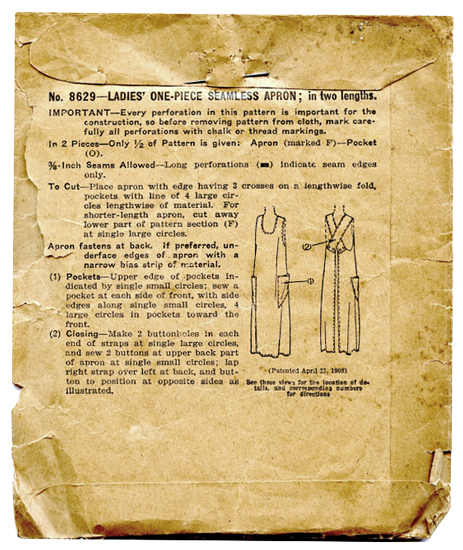 8629 is for a Ladies’ One Piece seamless Apron; in two lengths. It is from the late nineteen-teens to about 1920. Sense and Sensibility Patterns has a full range of historical patterns for ladies of all ages, covering Georgian, Regency, Romantic, Edwardian, Titanic/Teens, 1940s and 1950s styles. Jennie of S & S Patterns has some 20 patterns available, including an Edwardian Apron Pattern that was inspired by a beautiful circa 1910-1912 pattern in her own collection. She added more sizes and back ties for a nicer fit. There is an Edwardian Apron Pattern for Girls, too, or you may like the Folkwear #213 Child’s Prairie Dress & Pinafore pattern. Elizabeth Stewart Clark from The Sewing Academy has a few free patterns for children’s pinafores that are simple to cut and construct. 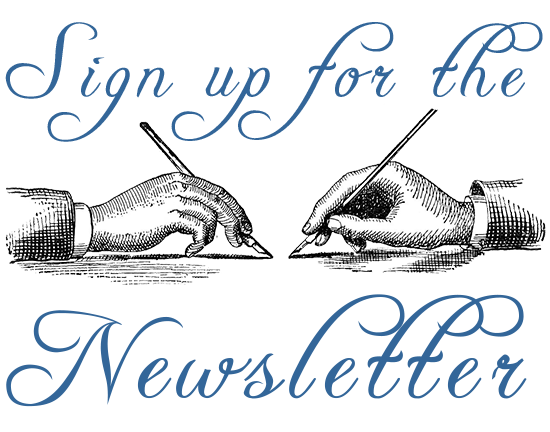 The Sewing Academy focuses on the 1840-1865 era, and offers tips and tutorials, in addition to workshops, books and patterns for historically accurate sewing projects. There is also a conversation board of mid-century living history enthusiasts and researchers, getting together to share ideas, question old ideas, and move forward with their individual history goals. Thanks, Elizabeth! 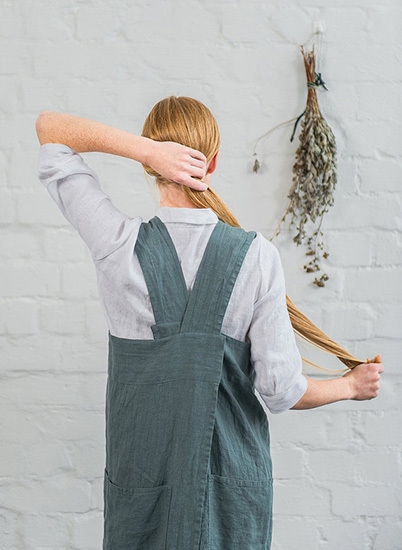 The Easy Smock Frock from Verity Hope (who lives by the river Thames in England) is one of my favorite contemporary pinafore patterns. 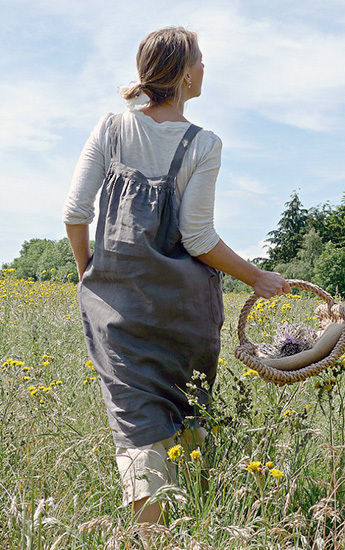 It feels both classic and up-to-date, the kind of apron pinafore you can wear anywhere. 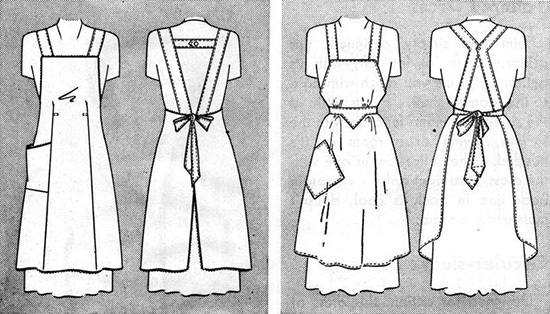 She also has a Flower Picking Pinny 1930s apron dress PDF pattern and a Pretty Pantaloons PDF sewing pattern so you will have something nice to wear under your handmade apron dress. When it comes to wearing your apron pinafore dress out in the world, ruffles and layering are in. You can wear the apron dress over a shift, pants and a shirt, pantaloons, another dress or some combination of these. 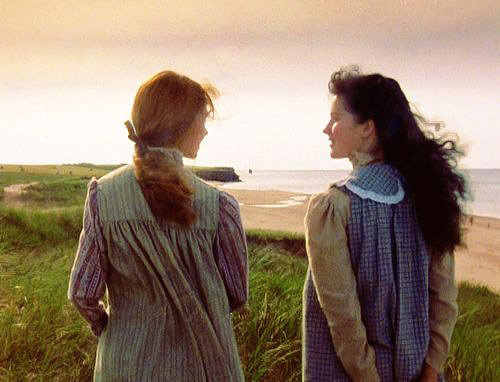 Though some feel that the costume choices in Pride and Prejudice (2005) are questionable, Willow and Thatch thinks the looks worn by the Bennet girls below would work perfectly as an apron-inspired fashion choice today. Take inspiration from Swedish designer Ewa i Walla, known for blending the looks of the past, present and future, layering, and natural materials such as cotton, linen, silk, wool and organdy. The overskirt, or overdress can double as an apron pinafore dress. Overskirts first came into fashion during the Victorian Era in 1867, after the pre-hoop and hoop periods of multiple petticoats and crinoline, and before the bustle period. Early skirts were often looped up for walking, showing a pretty petticoat underneath, which led to the introduction of the overskirt. 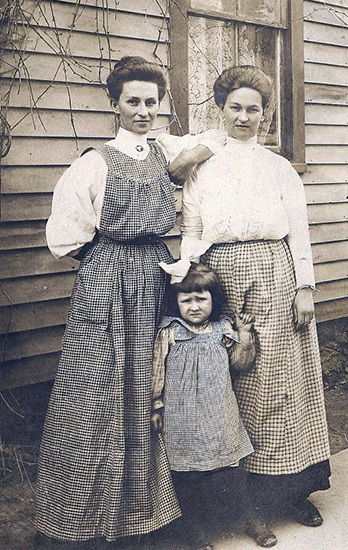 More practical bibs and aprons used to protect clothing underneath were predecessors to the fashionable overskirt. This overdress circa 1800 -1810 is in the collection at the Fine Arts Museums of San Francisco. 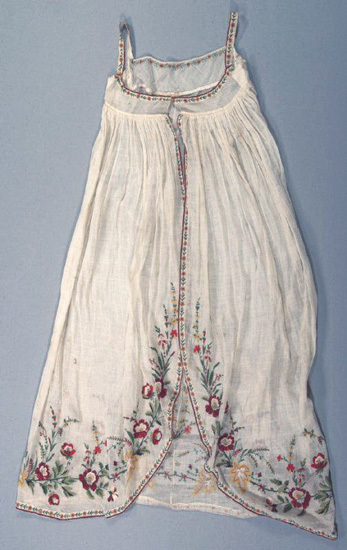 The description reads: Overdress of natural sheer cotton with polychromatic wool embroidery: very narrow bodice; straight drawstring neckline closure at center front; narrow band of embroidery along neckline and shoulder; evidence that sleeves may have been removed from band at shoulder; center front opening skirt gathered into empire line waistband; narrow band of embroidery along sloped skirt hem; broad floral embroidered pattern follows skirt hemline; embroidered floral sprays extend up front. This 19th century Russian sarafan, or traditional jumper pinafore, is also stunning. Reworked in a more practical fabric, this style could be fun to wear as a pinafore on a regular basis. The dress below is no longer available, but was made by an Australian company named Lee Mathews. While it was probably designed to be worn as-is, Willow and Thatch thinks it would be so pretty as a modern day overdress. 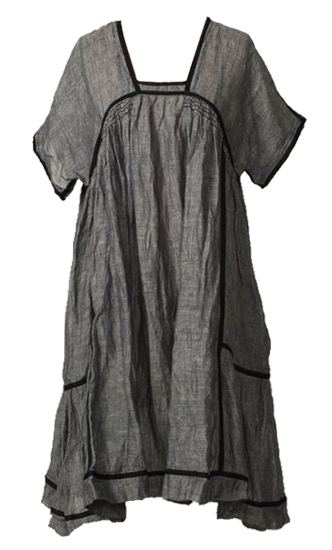 It looks to be durable and generous like an artist smock, but could be really gorgeous layered over a petticoat . With prairie boots, I think. 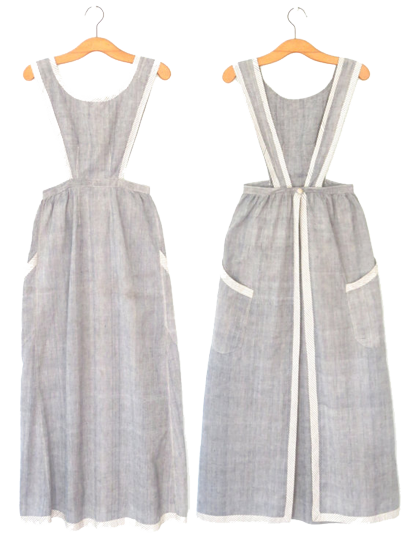 One of my favorite staples is the linen apron pinafore. 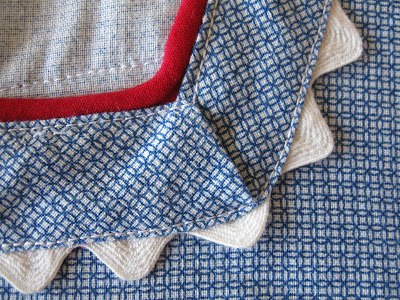 This linen full length square-cross apron, available on Etsy from Lost in Linen, slips on over the head with no sashes to tie. The wide straps ensure they don’t fall off the shoulders. Not a dress, but an apron you could consider part of your outfit while actually being practical for the work you need to get done. 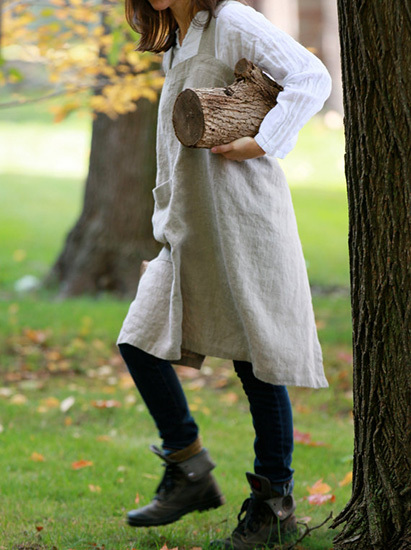 This no-tie pinafore, or Japanese apron, is made from 100% natural Lithuanian linen. The apron has two huge pockets on each side, divided into two sections. Not Perfect Linen offers these on Etsy and says they get better with every wash and age. This could definitely be worn all day; it is cute and looks like a workhorse. And I just love this Edwardian era apron circa the turn of the century. Steely blue chambray with ticking trim, a long skirt that wraps around and a button at the waist make this a nice example of a turn of the century pinafore apron. This was also available on Etsy. Though it may have once been a servant’s apron, today it could be worn just about anywhere. Okay, maybe not anywhere, but it makes me smile to think of wearing it anywhere I like, layered over a long petticoat and a white voile cotton billowy shirt. 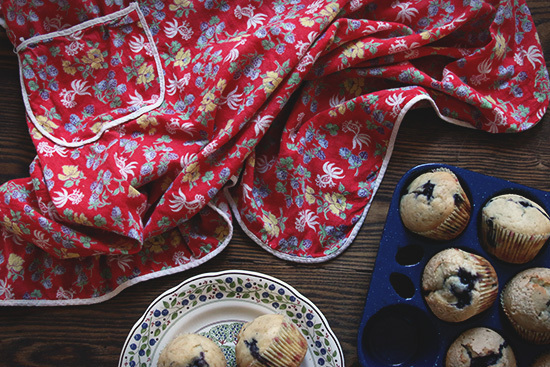 The muffins are done, and the apron is off. I used this recipe from Martha Stewart, substituting soy and almond milk for cow’s milk, and two eggs instead of one plus the two yolks. Next time I might add in some oats or another kind of flour, they are on the sweet side. The little plate is from Gien, France. This one is vintage but the company still makes all kinds of sweet things, perfect for tea-time. My cobalt blue muffin pan is quite old, and is a heavy cast iron covered in enamel, exactly like this one, which is for sale from Lace Wood Stone. Highly recommended for even cooking. Do you sew? Are you also a just a little obsessed with the apron pinafore? Willow and Thatch has some boards on Pinterest dedicated to the apron and pinafore; there is the Make an Apron Pinafore Dress board, and the Aprons and Pinafores board. You’ll also find apron-smock-pinafore sewing inspiration in the SMOCK board, in Clothes Closet, and in the Period Drama Dress – Costume Dramas board…old-fashioned embroidered details, linen, pleats and pin tucks abound! 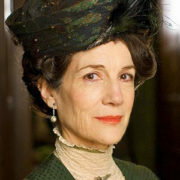 You may like the article Love, War and Housecoats: Setting the Scene for Home Fires Episode 3 by Julie Summers, author of Jambusters, the true story of the wartime Women’s Institute which inspired the hit ITV series, Home Fires. Julie is also the author of Fashion on the Ration, exploring style during the Second World War. Lastly, there’s a nice site with the history of the apron, with examples by era, here at Apron History. Willow and Thatch hopes this post has left you inspired to sew your own apron pinafore dress, or at least buy one and make some muffins! If you enjoyed this post, you’ll want to check out the Fashionable Romance: Wedding Gowns in Film post. And you’ll probably be interested in the Edwardian Era Period Films List, and the Costuming Pride and Prejudice post. Enjoy! What a lovely blog post, everything I love and thank you especially for including my Easy Fit apron dress! I was very happy to include it. You do beautiful work! What a nice post. I have found that once one takes up the habit of wearing aprons the idea of developing an entire wardrobe of them soon takes root. Right now I’m contemplating making an apron for my annual marmalade-making effort. I have a photo of me from the 1940s in a beautiful white pinafore taken at the General Wolfe hotel in Wolfeboro, New Hampshire. I’ve been wearing aprons of one kind or another since then, but I’m in my 70s now and must wear a pinafore again because I can no longer wear a neck yoke style apron. Came upon your website while searching for pinafores and find it charming and delightful. I’ll be returning to visit to read all your little gems. It must be a terrific photo! Thank you so much for sharing how you found the site, and I appreciate that you’ll be returning. Just yesterday I bought 4 lengths of soft, but heavy linen in muted blues and tans. I’m hoping to make them into apron – pinafores for friends and family for gifts. I recently came across a vintage smock with front buttons / snaps. Maybe something like that could work for you? Your site is so beautiful, it’s addictive! Thank you Pam! That’s such a nice compliment, and one that is much appreciated.